When it comes to reviews, glad tidings are always welcome! Dark Equinox is available from the publisher, or from Amazon in both print and Kindle formats. She Walks In Shadows available now! Received my contributor’s copy of She Walks in Shadows this week – just in time for Halloween! Edited by Silvia Moreno-Garcia & Paula R. Stiles, this anthology of Lovecraftian tales by women features authors & artists from several countries, all investigating & expanding upon the feminine side of the Mythos. Some provide new views of established characters / entities, others (including myself, in the anthology’s one poem) offer entirely new creations to stretch the bounds of Lovecraftian weirdness. Find the whole TOC – plus easy ordering information – here. She Walks in Shadows is available in both paperback & ebook formats. And I am so thrilled to be a part of this puppy. To the possible detriment of the world’s collective sanity, Cthulhu Fhtagn! is available today from Word Horde. Editor/publisher Ross E. Lockhart reports that copies will be arriving at Word Horde HQ “later today,” & that direct orders will be being fulfilled this week. Retailer links to Amazon (where you can preorder your Kindle copies already! ), Ingram, B & N, and other places will be appearing on the anthology’s page as they go live. Find all the ordering information you’ll need here. Dark Equinox cover reveal -- & more news! The book will be available from Amazon in mid-August -- but preorders placed through the Hippocampus Press website ship in July. A combo pack discount (for Dark Equinox & Twisted In Dream, my most recent dark poetry collection) is still available. Find all the details here. And if you’re joining the pilgrimage in August, I’ll be at NecronomiCon Providence August 20-23. More details on that when my panels & reading(s) are finalized, but the current schedule is already up here. 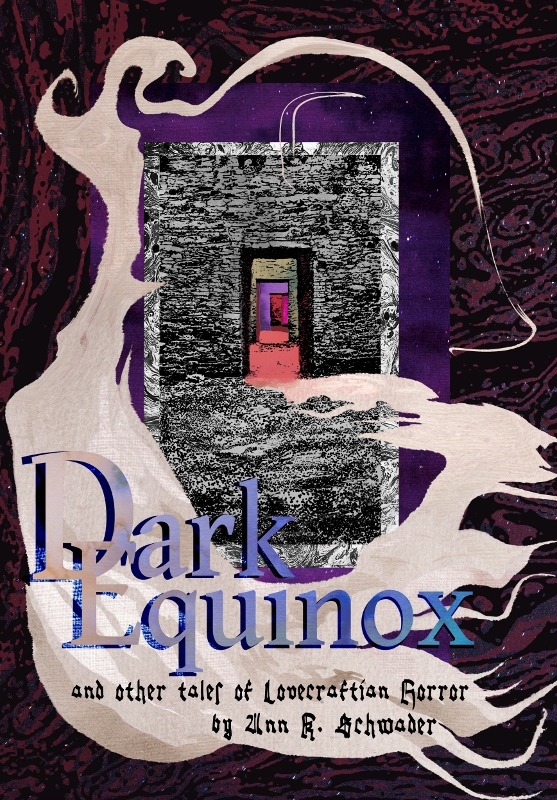 I am (incredibly) happy to report that Hippocampus Press is now taking preorders for my second weird / Lovecraftian fiction collection, Dark Equinox. Find all the details – and a draft version of creepy Southwestern cover art by Lyndsay Harper! – here. For May, at least, Hippocampus Press is also offering a package deal on Dark Equinox & my omnibus weird poetry collection Twisted in Dream. Find details here. This one came out in 2011, & includes my very SF 36-sonnet sequence In the Yaddith Time. I’ll be posting more details & a real “cover reveal” later. For now, happy Mother’s Day weekend to any & all moms reading. Stay weird! I’m delighted to announce that Black Wings IV (PS Publishing, February 2015) is now available for preorder. Edited by S.T. Joshi, this anthology is the latest in an excellent series of contemporary Lovecraftian anthologies. Full details – including the TOC – may be found here. Mike Davis’s excellent Lovecraft EZine blog remains a must-read for Lovecraftians in search of the newest & weirdest in the Mythos world -- and today’s post is definitely a case in point. Imagine, if you will, Cthulhu as a puppet play. (Or don’t, & save your sanity.) The Texas A&M-Commerce University Playhouse has, & will be presenting it this weekend! Unable to attend? It’s already available for free on YouTube, accessible right from Mike’s post. I haven’t yet watched this 43 minute video myself, so YMMV – but the concept is so delightfully bizarre, I felt compelled to post about it anyhow. Happy Birthday HPL: "The Perplexity from a Place Abroad" is up! As promised yesterday, editor Ross Lockhart’s The Book of Cthulhu website is celebrating the Bard of Providence’s 124th birthday with a brand new round-robin tale of eldritch terror. Entitled “The Perplexity from a Place Abroad,” it features six segments by Rand Burgess, Brian Evenson, Alistair Rennie, Kyle Muntz, Amanda Downum . . . and me. As I type this, segment #3 – mine – has just gone live. All segments are available on the site throughout the day (and afterwards, I suspect), so check in whenever you can. As for me, I don’t know how this puppy ends, either – so I’ll definitely be checking back as things progress! Got any plans to celebrate? If you’re still in the planning stages, why not check out editor Ross Lockhart’s The Book of Cthulhu site? Rumor has it that a brand new round-robin inspired by the Old Gent himself will be posted tomorrow, at the rate of one section per hour. And, yes, one of those sections is by Yours Truly. Join in the serial celebration! At long last: an all-female Lovecraftian anthology! I’m very pleased to be a squidling in the She Walks in Shadows project, edited by Innsmouth Free Press’s own Silvia Moreno-Garcia and Paula R. Stiles. Over a dozen female writers have agreed to write original works in the Lovecraft universe for this anthology. In my case, the work in question will be poetry. The campaign has only 31 days to run, and the proposed TOC is a pretty decent who’s who of women & entities in the Mythos. For all details, including a spiffy book trailer, check here. And, if you feel so inclined, Join Team Squid! Halloween Week: listen & read for free! Looking for some budget-friendly online scares to get your Halloween week started off right? Try these! 1) The Science Fiction Poetry Association's annual Halloween Poetry Reading is up now in full, with 9 poems (read by their creators) plus suitably atmospheric photos. Check here. 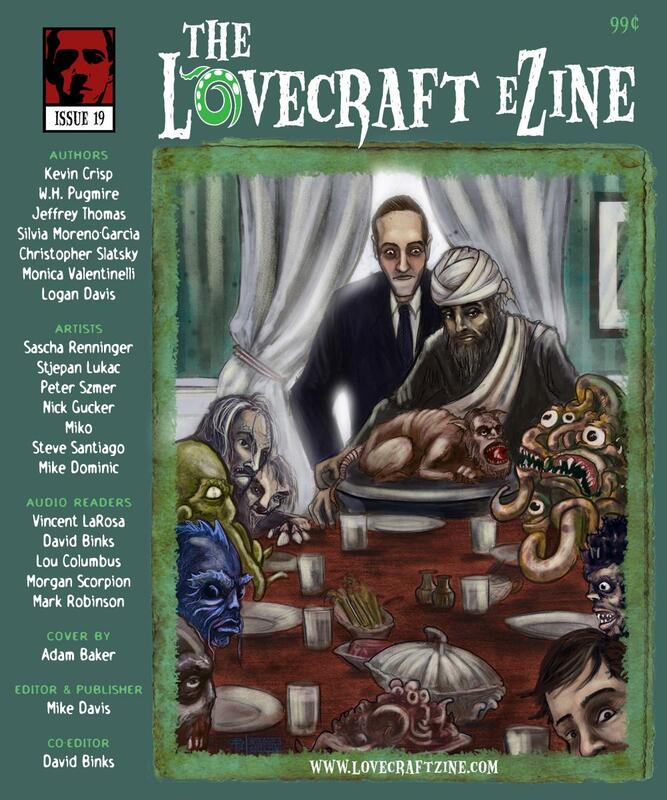 2) The Lovecraft eZine's 2013 Halloween issue -- its second special tribute to Roger Zelazny's A Night in the Lonesome October -- is available online now to read for free. 6 tales plus art, a Cthulhu comic, & an introduction by Trent Zelazny. (I haven't read this issue yet, but last year's was amazing.) Check out all the information (and the TOC) here. 3) And who doesn't love Cthulhu pumpkins? Podcast-loving Lovecraftians should definitely check out The Lovecraft Geek, a new question & answer podcast by noted HPL scholar Robert M. Price. All details are available here, from the Lovecraft eZine. The podcast can be downloaded from here, streamed, or subscribed to on iTunes. If you've got a question for Dr. Price, there is also a handy submission form. I've already listened to episode #1, & subscribed. Although some of the questions from this first episode were fairly basic, Dr. Price answered them in impressive detail (not that I'd have expected otherwise), and offered much new information. Like most podcasts, this one is completely free -- and definitely worth sampling if you are at all interested in the topic. This novella -- also included in Shadows From Norwood -- is a well-crafted & imaginative (mostly) bit of Lovecraftian fiction, set in one of my favorite eras. When a group of well-educated Bright Young Things encounter a hideous mystery in a South London churchyard, they must call upon all of their intellectual resources to cope with the consequences. Not surprisingly, said resources may not quite cover a problem of cosmic dimensions. This is a witty dark entertainment aimed at readers familiar with Lovecraft's work, &/or gamers in the related role-playing system. "Between the wars" Britain is done in the best Sayers/Wodehouse tradition, and the mathematical "explanation" of this particular Horror is something I haven't run into before in the Mythos. Unfortunately, the ending was a letdown for me. Without getting into spoilers, most dedicated Lovecraftians have met it before -- and with nearly the same details. Given the quality of the writing & atmosphere, however, many readers may still find this tale (or its associated collection) worth acquiring. YMMV. Pierre Comtois' classic weird fiction magazine Fungi is turning thirty -- and celebrating with a massive new issue! Fully illustrated & over 400 pages long, Fungi #21 features fiction & nonfiction from both rising stars and familiar dark names. The TOC includes such folks as Robert M. Price, Wilum Pugmire, Thomas Ligotti, Richard F. Searight, Colleen Drippe . . . & Ann K. Schwader. My short fiction piece, "Her Beloved Son," takes a decidedly revisionist look at Lavinia Whateley's family life. This issue will be officially released at NecronomiCon in August, but is available now. Or find it on Amazon. Cthulhu Haiku and Other Mythos Madness (Popcorn Press 2012), edited by Lester Smith, gets an extensive and favorable review this week on the Amazing Stories website. Diane Severson ( divadiane1) includes her own history with this anthology -- she backed it as a Kickstarter project -- as well as notes on H.P. Lovecraft, scifaiku, & some online sources for Lovecraftian fiction and poetry. In addition, Diane lends her professionally trained voice to an extensive selection of works from the anthology, available as a free download. Whether you prefer your Lovecraftian fiction for free online, on your Nook or Kindle (for 99 cents), or even as a podcast (free this time, as a test), you won't want to miss the latest issue of Lovecraft eZine. Forget that poor abused groundhog -- it's time for Lovecraftians to celebrate the accursed (not to mention eldritch, & possibly squamous) natal day of Wilbur Whateley. Born in the township of Dunwich on this date in 1913, he overcame his humble earthly origins & single parent upbringing to do his daddy proud . . . to the profound regret of the surrounding community. If you aren't familiar with Wilbur, check out all the particulars here. H.P. Lovecraft's "The Dunwich Horror" first appeared in the classic magazine Weird Tales in April, 1929. Is it possible to enjoy a book review of a book you've never heard of? In the case of Kari Sperring's review of Queen of K'n-Yan by Asamatsu Ken (translated by Kathleen Taiji), definitely. This relatively brief review from last week's Strange Horizons not only familiarizes the reader with various plot points of this intriguing novel -- a decidedly different take on Lovecraft's "The Mound" -- but also opens a window onto the Japanese way of writing HPL homages, and what this culture's fascination with the Mythos might mean. I started reading this review because my own story "Paradigm Wash" (Hon. Mention in Year's Best Fantasy & Horror, 2007) was also inspired by "The Mound." By the end, however, I had added Japanese Mythos fiction to my "must read" list for 2009.